In 2012, Code Authority was approached by a group of ambitious healthcare experts that had just started a company – that company was BroadJump. These experts were determined to provide pricing transparency across the medical supplies and equipment industry, but their business was still only a concept. The medical supplies industry can be murky when it comes to pricing, and BroadJump wanted to make that pricing crystal-clear. Not only did BroadJump need a built-from-scratch solution, they needed it quickly to match their business plans. Code Authority was honored to be selected as the firm to help BroadJump put down their roots. Through an extensive design and architecture phase, Code Authority made sure to capture all the requirements of this one-of-kind product. Still with the ambitious pace in mind, Code Authority’s team of developers took the idea and made it into a reality. BroadJump was provisioned with a 100% cloud-based solution to meet their every need in a secure and fast fashion. 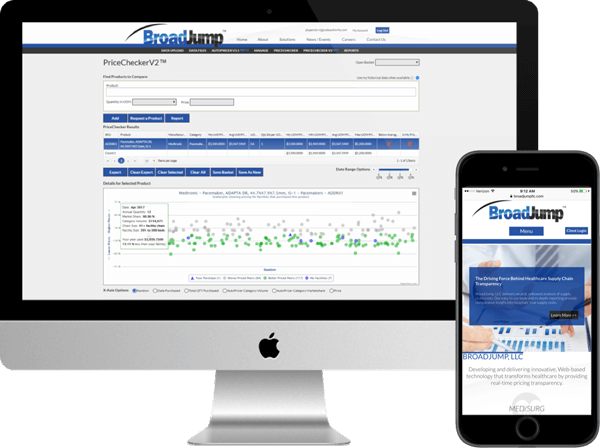 Code Authority matched BroadJump’s ambitious pace, helping them grow into one of the most renowned medical companies in the nation. You’ll have no worries about infrastructure, outsourcing or quality with our team’s cloud development capabilities. We’re a Microsoft partner with Gold Cloud Platform certification, focused on using the advantages of the cloud to build your software efficiently. "We wouldn't have a business without Code Authority. Code Authority has been an invaluable partner since sitting down at design five years ago, and through the entire journey."